There is a speaker called iBoutique Dancing Fountain Speaker listed for sale on Amazon. This is an interesting decorative product to gift someone. Its actually a speaker, and when you play music in this speaker, the water inside the speaker dances. The whole set contains two speakers, out of which, one is the main speaker. Since its a speaker it can be connected through any device like smartphone, dvd player, iphone, tablet, tape recorder, computer, laptop, ipods etc but these devices need to have a USB socket and audio jack. Now play any of your favorite music or song, through any of these devices, and the speaker will play the music or song for you, and it will also make the water in the speaker to dance on music beats. Here is a nice video review of this product. If you want to know how the technology behind the dancing water works, just watch this youtube video from an electronics student. There are also several LED lights inside the speaker, and those will also blink along with the music beats and water dancing. The LED lights are actually fixed on the base of the glass portion of the speakers, and mineral water is floating over the Led lights. In a way, the waterproof LED lights are in a merged state inside the water. When the speaker play music, both water and LED lights start reacting together, creating a wonderful scene of a fountain (with dancing water and glowing colorful lights) inside the glass portion of the speaker, and that is what the real fun is. The glass portion of the speaker is also sealed from the top, which prevents the water to come out of the speaker. This could be an ideal decorative product for home parties on different occasions. First there is a need to supply power to the speaker, and for that the purchasing package will come up with a USB cable. This USB cable can be used to give power supply to the speaker, from any USB socket based device, like your laptop or desktop. The purchasing package, however, will not come up with any power adapter to power the speakers. This is due to the fact, there is no any way to power the speakers through a power adapter and its only powered through USB cable. Just connect the speaker to any USB facilitated device and you are done. This was all done to provide DC current (power) to the speaker, but now we need a source for the music to get transferred from some device (through which you want to play music) to the speaker (as the speaker cannot play music on its own, it simply amplify the music coming from some other source), and for that we need another cable. This another cable needed is also supplied along with the purchasing package. This is not a USB cable but its a 3.5 mm audio jack cable for getting connected with a sound source. There is also one more cable supplied, to connect both the speakers together. So total 3 different types of cables are provided along with the purchasing package. People are actually importing different types of such water dancing fountain speakers from China, and then giving their own brand name to it, and selling it on Amazon, or on their own online or offline retail stores. If you want to buy these speakers in wholesale from China visit alibaba.com. Dancing fountain speaker, as mentioned above, is also listed for sale on alibaba.com here. If you are in UK this product can also be bought on sleekgadgets.co.uk. 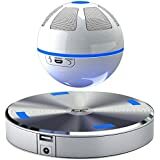 There are different types of speakers, and one another which is very popular, and unusual, is the levitating speaker which floats in mid air without falling. I have written more about this speaker in the article A speaker that floats in mid air disobeying gravity. This speaker could also be a great gift for someone, but its price is much higher, as it utilizes advanced technology to work against gravity. LinkPoints, a Korean Company, has also come up with a unique portable speaker called Mr. Everything. This speaker not only play your music, but it also has four USB ports to charge 4 different devices at a time. Its is portable, in the sense, that it can be carried anywhere with its easy to grip and lightweight handle. Another unique feature is the flashlight on its base, which can be used while moving out in the dark at night. The intensity and color of the flashlight can be modified as per the requirements. Mr. Everything utilizes a high-density 26800 mAh rechargeable lithium-ion polymer battery for all its operations, and it can charged with the power adapter provided. It also works on NFC bluetooth pairing, to pair other bluetooth devices with it. It also has a DC adapter to jumpstart even a car. To know more watch this youtube video. This lighting lamp can create a colorful rainbow on the wall of the room in dark. These two bath toys create lighting inside water through waterproof LED lights fitted inside them. This light will look in 3d once it starts glowing. Otherwise it is a 2d light with only length and width but not height.